With eight rounds still to come in the strongest super-tournament of the year, Mamedyarov, Carlsen and Caruana nosed ahead with victories and the Russian trio of Sergey Karjakin, Dmitry Andreikin and Alexander Morozevich remain closed behind half a point adrift along with Boris Gelfand of Israel. World champion Viswanathan Anand was off to a disappointing start, suffering a rare defeat as white against Fabiano Caruana of Italy in the first round of the Tal Memorial Chess Tournament here. On what turned out to be a tough day for the world champion, Caruana did everything right after sacrificing a pawn in the middle game and Anand had little clues to better the judgement of the young Italian genius. World number one Magnus Carlsen of Norway got off to a flying start defeating arch-rival Vladimir Kramnik of Russia to find himself in early lead in the 10-player round-robin tournament. Besides Carlsen and Caruana, Shakhriyar Mamedyarov of Azerbaijan made merry at the expense of blitz tournament winner Hikaru Nakamura of United States to be in joint lead. Anand, Kramnik and Nakamura are at the bottom but the standings are likely to change early as the second round gets underway in no time. Playing the white side of a Ruy Lopez, Anand was surprised to find Caruana playing one of the topical systems that involves a pawn sacrifice which, once declined, became a topic of discussion in the press room. 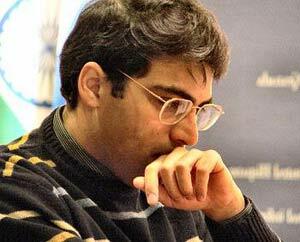 Anand finally had to take a pawn on the queen side but Caruana had built a fine counter-attacking resource by then. As the endgame arrived, Anand was already staring at defeat losing two pawns in tandem and Caruana made no mistakes to score his first victory against the world champion. After the blitz tournament, many pundits had written off Carlsen due to bad form but the Norwegian proved everyone wrong with a crushing victory against his nemesis Kramnik. Starting with the Trompovsky opening, Carlsen gave the enthusiasts another new opening to combat with and found Kramnik on the wrong foot in the intricacies that ensued. While Carlsen won in style in the Bishop and pawns endgame, Mamedyarov sacrificed a piece early to rip apart Nakamura's King side as black. It took just 31 moves for the Azerbaijani to complete the rout. Results round 1: V Anand (Ind) lost to Fabiano Caruana (Ita); Magnus Carlsen (Nor) beat Vladimir Kramnik (Rus); Hikaru Nakamura (Usa) lost to Shakhriyar Mamedyarov (Aze); Boris Gelfand (Isr) drew with Sergey Karjakin (Rus); Dmitry Andreikin (Rus) drew with Alexander Morozevich (Rus).